Oh how we love a big slice of strawberry cake, and today’s moist & delicious strawberry cake all starts with a simple cake mix! 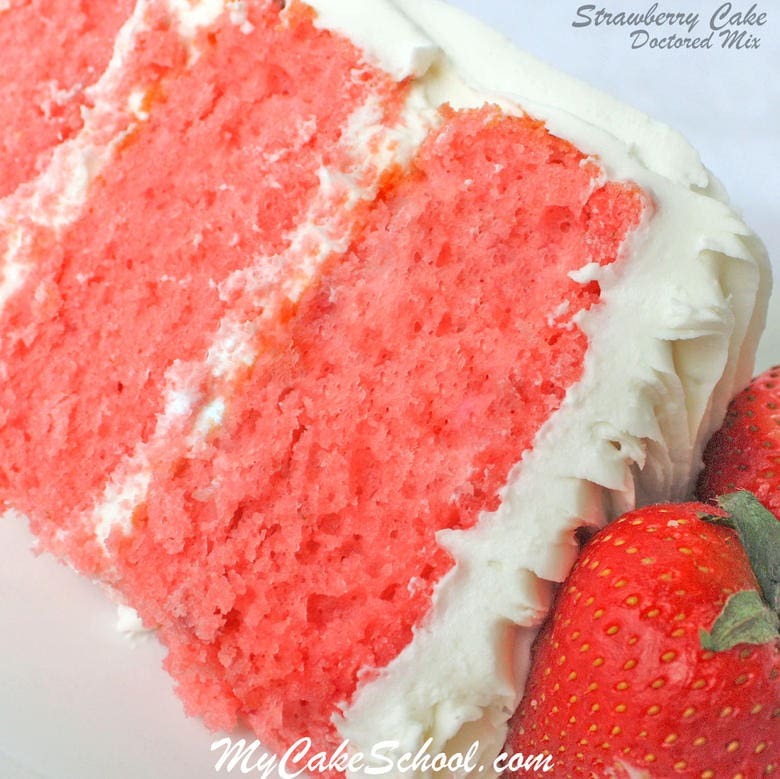 We have an amazing scratch strawberry cake recipe that we love, but sometimes you need a tried and true doctored cake mix recipe that you can whip up in a flash & that is guaranteed to please a crowd. THIS is that recipe! Have you ever stumbled into the message boards section of a cake decorating site only to find a heated discussion between cake mix bakers and scratch bakers about whether or not cake mix cakes count as homemade? It can be pretty entertaining, and did I mention heated? Well, I happen to love both scratch recipes and doctored cake mix recipes. If the cake tastes amazing, just bring me a fork, I’m not complaining! We have tons of favorite scratch cake recipes in our Recipes section, and we have tons of fantastic doctored cake mix recipes too. 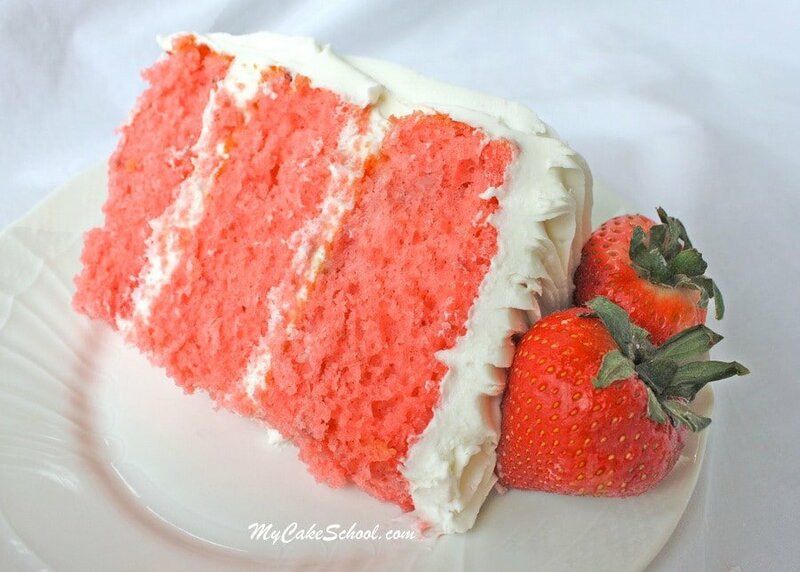 The plus of doctored cake mix recipes like today’s strawberry cake is that they can be whipped up in no time, and the addition of extra ingredients and flavorings really takes the cake texture and flavor to another level. Although you can easily find strawberry cake mixes at most grocery stores, we prefer to use white cake mix and then add a nice flavor boost from both pureed strawberries as well as strawberry jello. This cake has received rave reviews over the years and we hope that you enjoy it too! To make this recipe, prepare three 8 inch round pans. Next, add all of the ingredients including the white cake mix, strawberry jello, flour, eggs, vegetable oil, milk, and mashed strawberries. (By the way, I love that this recipe calls for real strawberries rather than just the jello. It really does make a difference in the strawberry flavor)! Then, it’s just a matter of dividing the batter between the pans and baking! Once my cake layers have baked, whether I’m working with cake mix or scratch cake layers, I remove them from the oven, allow to cool (in the pans) on cooling racks for about 10 minutes, and then flip them out, wrap with plastic wrap, and then with foil. Next, off to the freezer they go! Freezing the layers while they are still warm adds a noticeable boost in moisture. It’s a myth that freezing cake layers somehow results in a less flavorful or moist cake. We’ve been doing this for 15 years now! It really does make such a difference. We’ve frozen cake layers for up to 2-3 months and they still taste as fresh as the day they were made. I’ve even popped freshly baked, wrapped layers in the freezer for just a few hours when I’m in a time crunch! When the cake layers are ready to thaw, simply place the layers, still wrapped, on the countertop and allow them to come to room temperature (or at least partially thawed if you prefer to assemble while the layers are firm). Keeping the layers wrapped will ensure that the condensation forms on the foil rather than the cake itself. 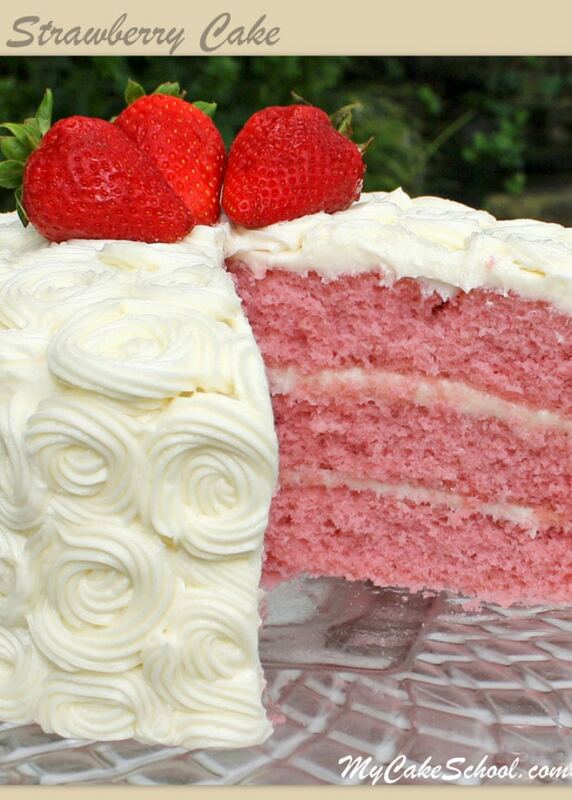 What Frostings & Fillings Taste Great with A Strawberry Layer Cake? We hope that you enjoy this wonderful recipe! We especially love strawberry cakes in spring and summer months, although I would never turn down a slice in the middle of winter ;0) It’s safe to say that strawberry cake is always a good idea, is sure to please any crowd! 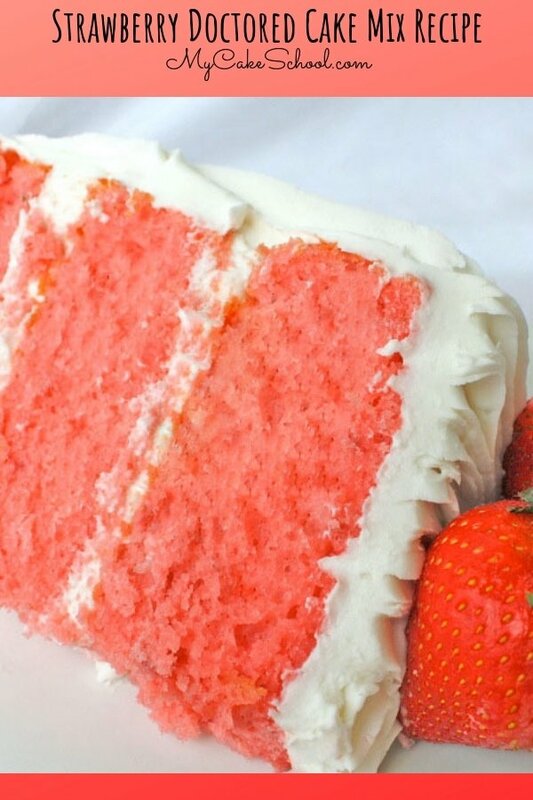 Save this Doctored Strawberry Cake Mix Recipe for Later! Click Here! This easy Strawberry Cake all starts with a simple cake mix! So flavorful! Put all ingredients into your mixing bowl and mix on low speed until the ingredients are blended. Then increase speed to medium and mix for approximately 3 minutes, scraping down sides of bowl mid way through. The mashed strawberries should be well blended into the batter. Bake for 30 min. or until tooth pick comes out clean. In addition to this doctored cake mix Strawberry Cake Recipe, we also have a scratch Strawberry Cake Recipe that we know you’ll love! Make sure to hop over and print or save a copy here! : Strawberry Cake from Scratch! Thanks for stopping by! 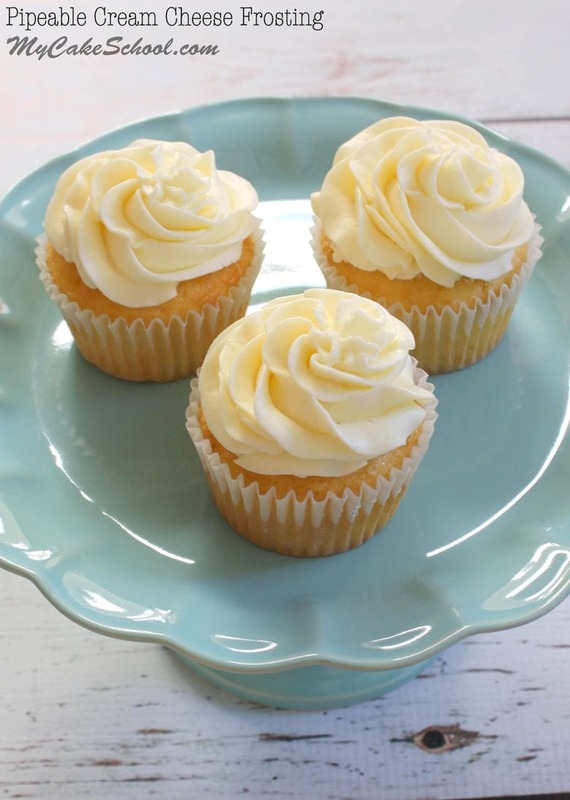 Make sure to check out our Recipes section for more of our favorite Cakes, Frostings, and Fillings! If you are interested in learning more about cake decorating, you should stop by our Free Cake Tutorials Section, which includes a Free Cake Video Tutorials Section! Can you make it in 6 inch pans instead? Unfortunately the manufacturer that makes cake mixes no longer make the 18.25; now they make 15.25. SO is there a proper recipe to make such a cake, like this strawberry cake, to equal to 18.25? What ingredients would I need to ad, like flour, and how much? If not that’s ok, just wondering. Thank you. Will this work in a 9×13 pan? Hi Mer, You will need 7 to 10 cups of cake batter for a 9×13 pan. I think this recipe makes about 5 cups batter, so you will need to double the recipe..
Hi Donna, I have not baked this recipe in a bundt pan but I think it would be fine to do so. Lower your oven rack to the lower 3rd of the oven. Bake at 350 degrees for 30 minutes check with a toothpick or long skewer to test if it is done. If using a dark colored bundt pan, bake at 325 degrees and shorten the baking time a bit probably 10 minutes, just keep an eye on it. Hi Lillian, I add from 3 to 6 Tablespoons flour to the cake mixes. In this recipe, I add 3 Tablespoons. Will this work well for cupcakes? And if so how many cupcakes will this recipe make? Thanks! Hi Chelsea, Yes, the recipe will work well for cupcakes. You should have at least 24 standard size cupcakes. Bake at 350 degrees for 18 to 20 minutes. Check at 18 minutes. I’m trying to make a strawberry banana cake. Do you think I could substitute the fresh strawberries with bananas? Or will it mess with the structure of the cake? Hi Beth, I think it may work because cakes using cake mix are so forgiving when creating recipes. Since I have not tried it, I cannot be 100% sure. Let me know how it goes. Can you make this and then freeze a couple days in advance and it will still taste good? Hi Courtney, Yes, you can freeze the cake layers and they will taste great. Wrap the layers individually in plastic wrap and then in aluminum foil. You want them to be airtight. You can freeze for up to two months. When ready to use, remove the layers from the freezer and place on the countertop. When condensation forms on the aluminum foil unwrap and allow to thaw. You can fill and frost your cake while the layers are partially frozen, if you like. If you are planning to smooth your cake using the Viva paper towel method the layers will need to be completely thawed. Hi! I am wondering if you have ever done this without the jello? We make our own flour and are still figuring out how to make proper cakes with it. Because of that, I went ahead and got a cake mix for this birthday party cake but my daughter desperately wants it to be strawberry. We don’t do dyes because of one of my sons, therefore can’t use Jello. Hi Bekah, Keep in mind that I have not tried this but instead to adjusting this recipe, I would use a white cake mix, we usually use Duncan Hines or any mix without pudding in the mix. Follow the directions on the back of the box, but instead of adding 1 cup water use 1 cup of pureed fresh or frozen strawberries. Also, add 1 teaspoon of strawberry extract, strawberries baked into a cake lose much of their flavor. To get a more intense strawberry flavor from the strawberries, you can cook the puree reducing over heat. You will need to puree probably 1 1/2 pounds strawberries. Simmer the pureed strawberries over low heat until you have 1 cup of the reduced puree. It will need to be completely cool before adding it to the cake batter. You will still need to add some strawberry extract, in my opinion. So you can use either the pureed strawberries or reduced (cooked) strawberry puree for the cake. Since the cake mix has so many additives as well as artificial flavor you may as well use the jello and have a good cake.